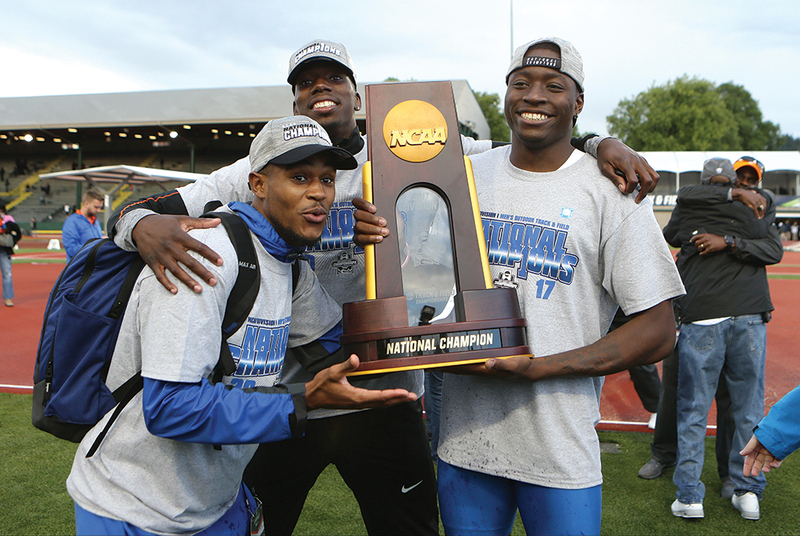 Florida has racked up quite the record in the NCAA Men’s Championships this decade. Since ’10, Mike Holloway’s Gators have finished, sequentially as No. 2, 3, 1, =1, 2, 2, 1, 1, 2. The way things are currently projecting, the Gainesville Gang is going to walk off with yet another win in Austin come June. 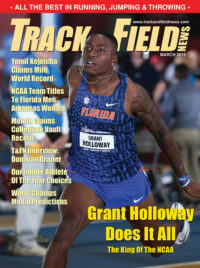 Florida’s big gun, of course, remains Grant Holloway, the 110H favorite who is also tabbed for 2nd in the long jump and will be a big factor in the placings of the favored 4×1 and second-rated 4×4. With Holloway in the mix, the crystal ball says that Florida will beat SEC rival LSU by 8 points. Without him, it’s obviously a different ballgame. Although a perennial powerhouse, the Bayou Bengals haven’t reached the top step of the podium since ’02. The two schools will have plenty of chances to control their own destiny, as they’re currently scheduled to go head-to-head in 7 events: both relays, plus the 200, 110H, HJ, LJ & HT. At this point, it’s a very close call for the No. 3 position, with only 3 points separating Texas Tech, Texas A&M, Houston & defending champ Georgia.